The Mooch was sold as a pet. When the people decided they didn't like her, we bought her back. She was the mother of 2 champions, one of which, Ch. Domino Pull up Your Sox, was a Specialty Best of Breed Winner.Her show career consisted of a few shows, where she took several points after the age of 5. 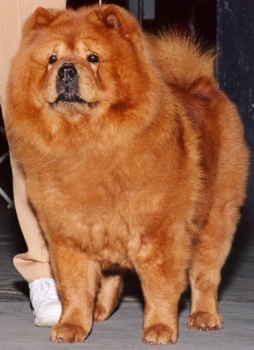 She lived to the ripe old age of 14 years.In her last show appearance two months before she died, she was BOS in Veterans Sweepstakes at the Chow Chow Club of Greater NY Specialty. Page Hits: 11,168 © 1997-2019 Domino Chow Chows, All Rights Reserved.